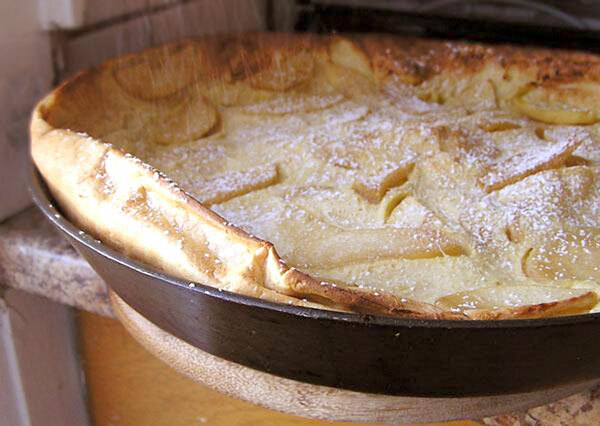 In a medium skillet over medium-high heat, combine ¼ cup butter, 3 tablespoons brown sugar and apple liqueur over, stirring until sugar is dissolved. Add apple slices and cook until evenly coated and tender, about 10 – 12 minutes. Reserve and keep warm. In a medium bowl, whisk eggs, milk, flour, vanilla, remaining brown sugar and salt together. Stir the apple slices into the egg/milk mixture. Melt the remaining 2 tablespoons butter in a large skillet over medium heat. Pour the batter into the skillet, then place the skillet into the preheated oven. Bake until puffed and golden, about 25 – 30 minutes. Remove, top with sifted icing sugar and serve with yogurt and a small drizzle of honey, maple syrup or some reduced, thickened apple liqueur.